I didn’t want to write this segment, which is why it’s been a fair stretch between the last post and this one. Basically, I’ve just been putting it off. And just so we’re clear, my aversion to writing it really had nothing to do with what I was going to say, and everything to do with the reason it needs to be said. Anyone who pays attention the news these days, even badly, knows negativity in the world is rampant right now. Like most of you, I wish there was some way to change it, or at least, dampen it a bit. Maybe even slow it down for a collective deep breath. Sadly, these things take compassion and understanding; two qualities which are not always organic in our world, and that leads to tragedy. In a world where negativity, ignorance, and even callous disregard for human life can take over and inundate our news cycles, personal interactions, and every day communication with those we may not understand, our job with the kids we help has to include a clear demonstration of compassion, caring, and postive interest in their well-being and development. Be a shining light, no matter what it takes. To borrow a popular phrase from the movie Field of Dreams, “go the distance” in your Vision Therapy room. There are many cliches available which demonstrate the idea here and they all eventually reach the same conclusion – finish the job. There’s lot of directions to travel with patient care. Many of us follow similar, and yet very different, paths when it comes to patient care administration and philosophies. All are good. Sure, one doctor/therapist team may prefer a certain treatment path over another, but in the end, everyone in this profession reaches for the same set of stars – the life changers. Although differences in opinion may exist, you can be sure everyone in Developmental Optometry is committed to making a difference. And sometimes, making a difference means we need to be different, be better, be someone who clearly goes the extra mile to ensure those around understand their worth in the world. There’s not many other professions where this could be possible, but for ours it can be, it should be, it takes so little to make the greatest impact on these young lives. It starts with good VT, but it doesn’t end there; or at least, it shouldn’t. Go the extra mile. Buy those Girls Scout cookies from a patient, attend a Little League game if a patient invites you, go to the swim meets, the track events, the basketball games, the bat mitzvah’s, buy in to their fundraisers, support them any way you are able. Spend 30 minutes of your weekend being important to someone else; namely, a patient. Do you have any idea how awesome your patients will think you are if you show up to their sporting event or dance recital? You don’t even need to stay long, just make an appearance and show them you care. Find out your patient’s interests, do some homework, and have a genuine conversation. Even if it means understanding Pokemon Go – and yes, it drives me nuts too – but do it. Show them you care. Some of the best moments I’ve had with patients are the direct result of my making just a small amount of extra effort away from the office. I know, I know. You’re busy. You don’t have time. You have your own life. I don’t care. Do it anyway. If the madness in our world is to ever subside, if people of substance are ever to once again demonstrate goodwill trumps negative influence, then we need to be willing to take that one step. Which, with any luck will be followed by many, many, more people willing to take a step towards showing someone they care. And you have no idea if your one step with one person is the snowflake which leads to a snowball rolling down the mountain until you do it. Do whatever it takes to show your patients and their family that you care. Is going the extra mile included in your paycheck? Could you consider me crazy for suggesting this is the level of change you alone could initiate? Is the phrase credited to the Chinese philosopher Laozi true in that “a journey of a thousand miles begins with a single step”? 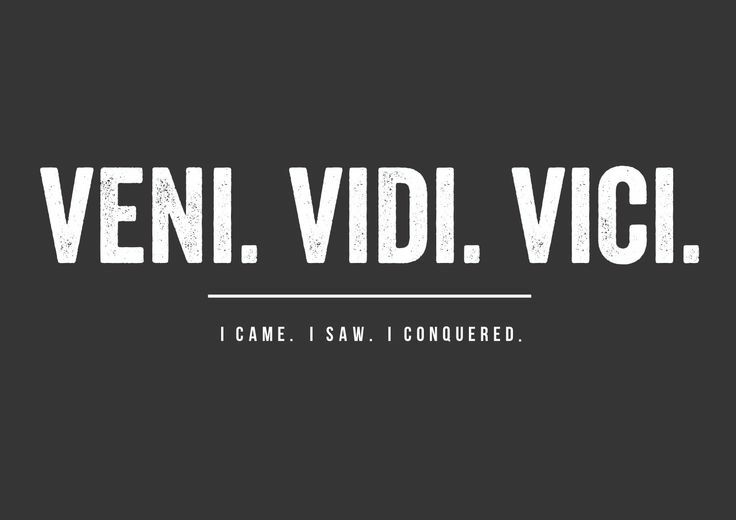 I started this post with a graphic which reads Veni, Vidi, Vici, which is Latin for “I came, I saw, I conquered”. Conquer the kindness. Prove to your patients this is not just about a paycheck, a billable hour, or achieving four activities during a VT session. This is about something much more important than all those things. This is about showing them you care about the person on the inside. Take one extra step – a step which no other professional would dare to take – and see what happens. Don’t just be different. Be someone who makes a difference. Posted on July 17, 2016, in From My Perspective.... Bookmark the permalink. 6 Comments. This is how we do it. I enjoy the piano recitals, soccer games, school plays, band concerts these kids are amazing in and out of the office. They really are. Thanks for reading! It really is. Thanks for reading! WONDERFUL BLOG – AND YES I AM SHOUTING!!!! !